Excellent food, Excellent drinks and Excellent Service! At Hanbury’s Restaurant, Oak beams, old pine ceilings, stone fireplaces, reclaimed brick and fresh reconditioned tables and chairs all gave the restaurant a ‘seaside cosy feel’. Most of the furniture is made from reclaimed vintage pine from local railway station buildings. Our large family table was an old church door which we have decorated with seashells. Many other artifacts can be discovered throughout the restaurant, such as an original Dartmoor Prison door and a model of a 1919 Italian Sea Plane. 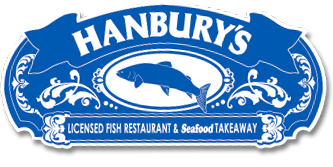 We cook delicious, fresh, award winning fish and chips, which is what Hanbury’s is famous for. We are also able to offer a wider range of specials and change our menu to coincide with what fresh, local fish is available. We offer full waiter/waitress service with disabled and baby-changing facilities. We are also available to cater for those special celebrations and any private dining requirements you may have. Please contact us and we will be sure to make your event extraordinary.